I enjoyed this book more than I can say. Julia's honest speech and raw wit are delightful. I loved seeing the stories behind what made her who she was. Her drive and compulsion are the stuff of legend. Obviously, she is a perfectionist, but it was her charm and humor made her seem just perfect. How I wish I could have pulled up a chair in her kitchen. 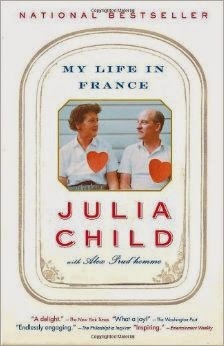 You probably watched Julie and Julia and know the gist of Julia's story. (Wasn't Meryl Streep fantastic!) The book fills in the details and all from Julia's perspective. You can see how her husband's government job led them to France and how her very first meal there led her on a adventure to learn to cook French food, though she had never been interested in cooking before. The book follows them on stints in several different countries. The most fascinating thing to me was how devoted she was to this cookbook for a decade. 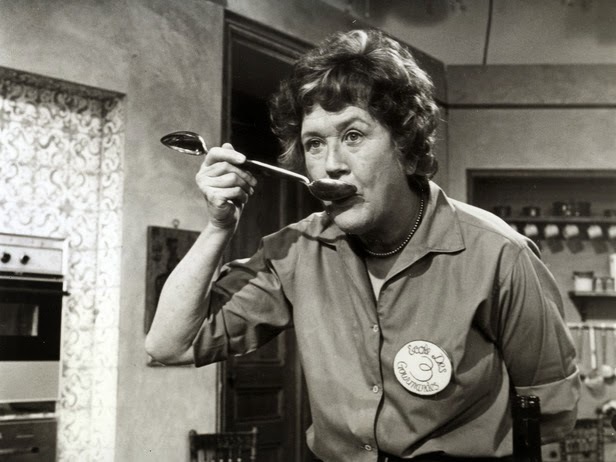 She truly did master the art of French cooking. I fell a little head over heels for her in this book. (Someone send me Mastering the Art of French Cooking.) I'll make you dinner. I love to cook. I love the chemistry and learning how things go together. Open air farmer's markets are a part of my heart. Julia's love of people, food, and hospitality stirred me. Let's dine together. I thought that it was great that she had written this book at the end of her life. She actually passed away before it was published. Her nephew finished and published the book after they had collaborated. Most of the other people in her story and also passed away so her tale was very honest. She told of struggles with her cookbook collaborators and how she showed grace and worked through things. Perhaps she would not have felt so free while the people she loved were alive. It spoke volumes to me about struggle and how to love and be a friend at all times. Of course, that was probably not her intent. She was just being Julia. Let's all curl up and watch some Julia.